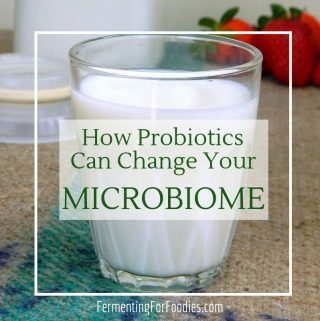 If you are uncertain about making dairy cultures, or fermenting in general, then I recommend starting with yogurt. (And sauerkraut… but that’s a different topic). I currently make 4 liters of yogurt (a gallon jug) nearly every other week! After trying out a few different brands of yogurt, I have found one that comes out thick every time, without any of the additives (guar gum, pectin, gelatin, milk powder, etc.) that are used to thicken store bought yogurt. 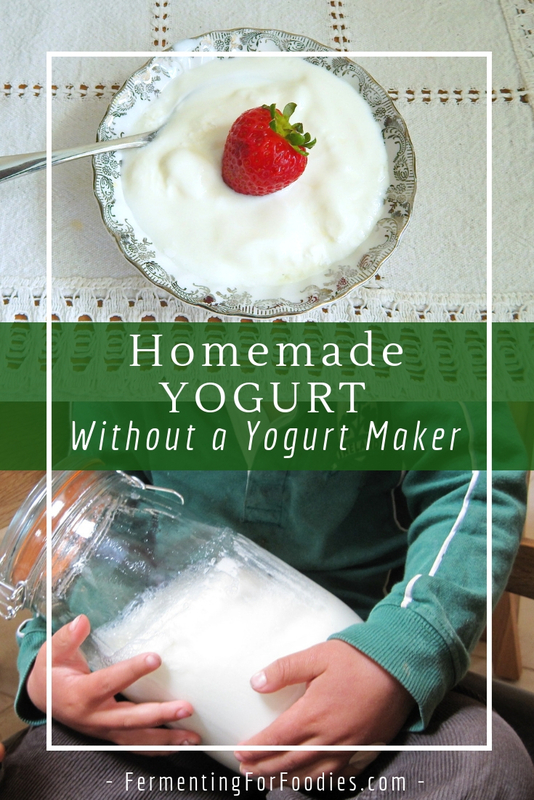 You can make yogurt without any special ingredients or kitchen tools. Yogurt is used to make of all sort of other cultured foods. 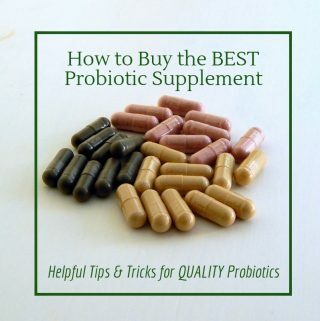 If you want more probiotics in your life, then yogurt is a really good option because dairy helps probiotics survive though your stomach. Almost everyone likes yogurt. There are even vegan options for anyone who doesn’t eat dairy. You don’t need a yogurt maker to make yogurt. I think that yogurt makers are what put people off of making yogurt. They envision having to fill 6 tiny jars to make very little yogurt. It’s certainly something that I would find very frustrating considering how much yogurt we eat! I use a folding fermentation box so that I can make a large volume of yogurt at once. Before I had my fermentation box I wrapped my jars of yogurt up in warm wool sweaters and left them on the shelf above my hot water heater. It took a little longer, but it always worked. You could put your yogurt in the oven with the oven light on. You could put your jars of yogurt in a cooler to keep them warm! Use a slow cooker on the keep warm setting. (I don’t recommend making your yogurt in a slow cooker because transferring it into jars may cause your yogurt to not set as thickly. Just put a few jars of yogurt into your slow cooker). Frankly, using the hot water heater closet has always worked for me! Slowly heat your milk to 180 F (80 C), whisking occasionally to keep the milk from scalding on the bottom of the pot. (Heating the milk causes the proteins to denature making for thicker yogurt. You could skip this step, but your yogurt won't be as much fun). Pour the milk into the final culturing containers and cool to 105 F (40C). Stir culture into the yogurt. (If you are using store bought yogurt you may want to up to 6 Tbsp yogurt as they tend to have weaker cultures). Maintain at around 110F (40 C) until it is set to a pudding like consistency (for at least 4 hours, or if you like a sour yogurt with more bacteria then you can leave your yogurt for up to 24 hours). , then heat your yogurt until it whisks up nice and frothy, then cool it to just above room temperature. However, I recommend getting a thermometer if you want to make nice thick yogurt because heating the milk to 80C is key to thick yogurt. 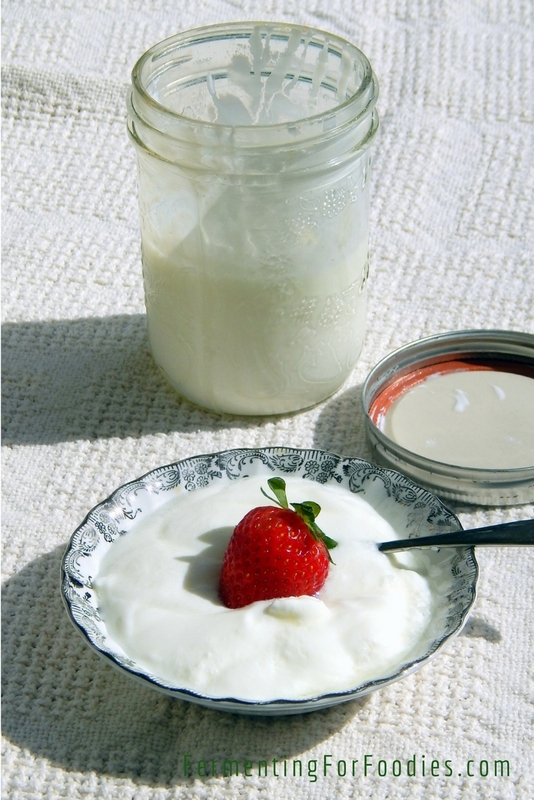 Homemade yogurt can be flavoured just like store bought yogurt. Add jam, fresh fruit, vanilla, or cinnamon. Delicious! Here’s my recipe for Greek yogurt or labneh. It just requires straining the yogurt to thicken it. 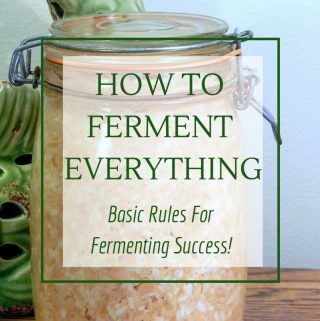 The whey can be used baking or as a starter culture for other ferments. If you want make cream-top yogurt, use non-homogenized milk. 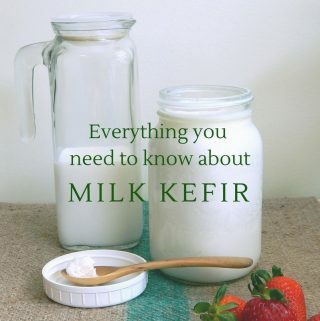 Or if you can’t find non-homogenized milk then add a few tablespoons of cream in the top of the jar before fermenting. It won’t be the same, but it will taste good! You added the yogurt starter before the milk cooled to 40C and accidentally cooked the bacteria. It wasn’t warm enough during the culturing.